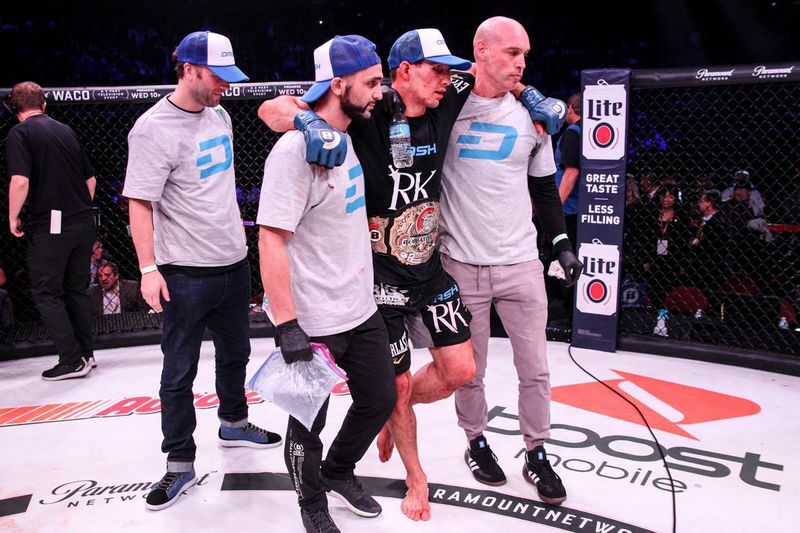 Standing in the center of the cage, victorious after going five grueling rounds with Douglas Lima, newly crowned Bellator welterweight champion Rory MacDonald was graced with his hard-earned championship belt. What may have been missed in that coronation was that “The Red King” was also representing a new brand, one that could become a major player in the MMA fighter compensation landscape. That brand is Dash, a growing cryptocurrency company that emphasizes anonymity and speed as a means to differentiate itself in a field where privacy and lengthy transaction confirmation times can be an issue. For network operations head Jeff Smith, it’s important to spread the word of Dash through unconventional means, and his passion for MMA led him right to MacDonald. MacDonald has long been vocal about his interest in cryptocurrency, and last year Smith sought to contact him and sell him on the virtues of working with Dash. The two both hail from British Columbia, and Smith has even trained at the Toshido Fighting Arts Academy in Kelowna, where MacDonald began his martial arts journey. Smith and his team were in attendance at Bellator 192 in Inglewood, Calif., on Jan. 20 — decked out in turtlenecks in homage to the stylish MacDonald — to see the Canadian win a world title while wearing a hat, t-shirt, and shorts bearing their logo. But this was no ordinary sponsorship. The process under which MacDonald became a representative of Dash was more complicated than a handful executives simply signing off on the deal that ended up being for 320 Dash, which at the time was worth $250,000. As is typical with cryptocurrency, the value of MacDonald’s dash payout has fluctuated greatly since the Dash was transferred, but it’s six-figure starting point is impressive when you consider that the Reebok sponsorship payout for the UFC’s recent card in Austin, Tex., came out to $165,000 total for the 24 fighters on that show. Given that eye-popping number, other fighters could soon be burying Smith’s inbox with messages asking how they can get a piece of the pie, and he’s excited about the prospect of working further with Bellator and company president Scott Coker to get more athletes involved. Smith describes cryptocurrency as being “misunderstood” and “misconstrued” at times, similar to how MMA has been ever since it emerged on the sports scene in the 90s. The digital asset is unregulated and decentralized, meaning it is governed solely by its investors without oversight from any major financial institutions. In that sense, it could be the perfect avenue for fighters willing to take risks in pursuit of greater compensation. ”What I’m starting to get now is that there are these fighters that are realizing that this alternative method of payment is available, and that’s really kind of starting to resonate throughout that community because they haven’t had that ability before,” said Smith. “For us, we specifically wanted to use Bellator because of the opportunities — the place for me was I want the money in the hands of the fighters. Because we have a lot of power as an advertiser, I can go to these companies and say, ‘I want to advertise with you, but I also want to put some of our money into the fighters’ pockets as well or even into the fans’ pockets, so we’re working on some … very interesting models with how you can do all these things. Rory MacDonald and his team all donned Dash gear for his championship bout at Bellator 192. As the de facto ambassador for Dash in the MMA world, MacDonald has been hit up on social media by people wanting to learn about cryptocurrency, but he’s found that fighters are still reluctant to fully embrace the concept. MacDonald had high praise for his fellow Bellator fighter’s pitch, which includes wanting to see the Bellator cage decorated with the Dash logo, potentially making a broadcast a two-to-three-hour long commercial for the company. For Smith, the key to making it all work is educating fighters on the virtues of Dash as an investment. He compares it to buying a house, a physical property of which there is only one in a specific city with a specific address. Unlike a house, one can take their digital currency with them anywhere and transfer it to associates just as easily. Like property, it is also a finite resource. And it’s a resource that could be exclusive to promotions outside the UFC, that are free of any sponsorship restrictions. ”Once you realize that value — yes, Rory fought for 320 Dash, but with where we’re going in another few years and the difference we’re going to have in the world, that will probably be millions of dollars worth of Dash, and so I believe we’ll get to a point where you can see the fighters might not have a choice but to go and fight for Bellator because they don’t want to miss out on fighting for crypto at this amazingly early stage,” said Smith. Smith envisions a scenario where his company not only works with fighters, but with Bellator itself to introduce fight night bonuses similar to those seen in the UFC; only in this case, Dash would foot the bill, not the promotion. Barriers remain between Smith’s dreams and reality, but overall Smith has been thrilled with the response to his MMA overtures so far, especially since they’ve already gone farther with Bellator than he initially expected. With the organization’s welterweight champion championing his cause, Smith is confident that cryptocurrency is just beginning to make its mark on MMA. ”The one thing that I was absolutely blown away by is that nobody ever questioned taking the Dash,” said Smith. “That I thought would always be a full stop, that we wouldn’t even get in the door because ‘what if I don’t want this and I just want the other thing’ and all that, and I think that’s a true testament of the fact that cryptocurrency and digital currency is really here to stay. People are not asking whether it’s worth anything or not anymore, they can truly trust and understand what it’s worth and they’re trying to accumulate it.